I feel like I'm not getting anything accomplished lately. I find patterns I want to make, fiber I have to buy, new tools to do the work - but nothing actually gets done. I need to change that. 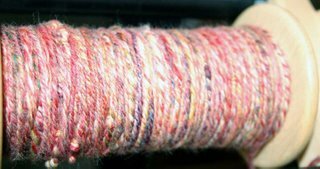 Kristi has started a summer spinning challenge and I think I'm going to join. Each participant sets their own personal goals and then posts progress updates on the spring challenge blog. I think my goal (initially anyway) will be to spin a certain amount of time every day. And to try new fibers and techniques. The challenge begins on the summer soltice (signup by June 15) and ends on the fall equinox. Want to join me? Instructions for joining are here. In that spirit, I did my first ever Navaho plying tonight. 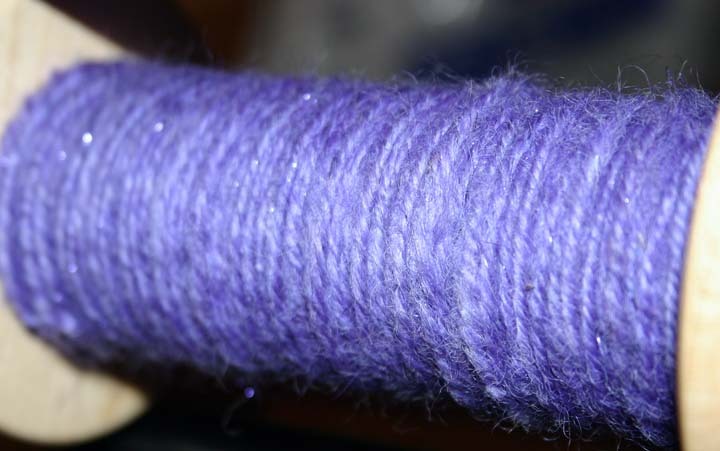 I had spun some of the Merino 64's that I bought from Village Spin & Weave and then just left it sitting on the bobbin. I thought I wanted to Navaho ply it - I wanted to keep the colors 'clean' and not ply two strands together - but kept procrastinating on actually doing anything. 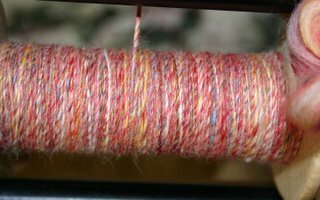 Tonight I watched the plying video at Joy of Handspinning, sat down at the wheel, and just did it. And you know what? It wasn't hard at all. It's definitely overspun (it looks like a corkscrew!) I'll see how bad it really is once the twist is set. But I did it! I'm going to set goals for crochet, embroidery and lockerhooking, too. Tomorrow. You could pop that bobbin of Navajo plied into your lazy kate and run it back through your wheel in the direction of your singles spinning to take out some of that excess plying. We learned that in our second level spinning class. 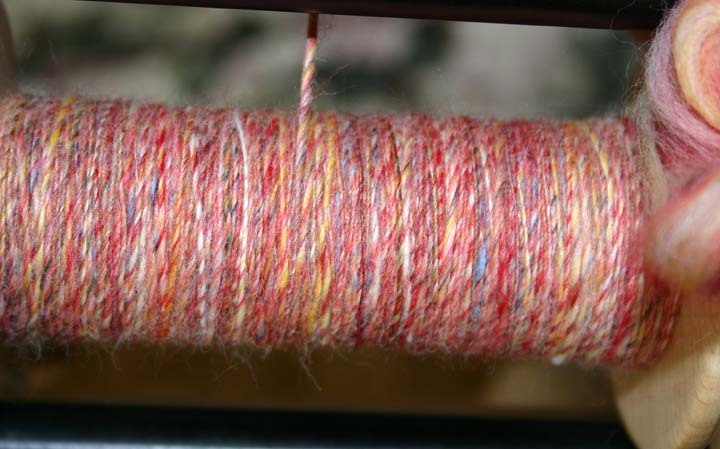 I haven't done any Navajo plying that isn't overplied by a lot. I need to practice that! Brilliant! Thanks Kristi, I'll do that tonight.